This entry was posted on Monday, November 7th, 2011 at 10:15 and is filed under Business, Defense, Economics, Federal Budget, News, Politics, War. Anyone consider the effect of switching CIA Director and Secretary of Defense positions. 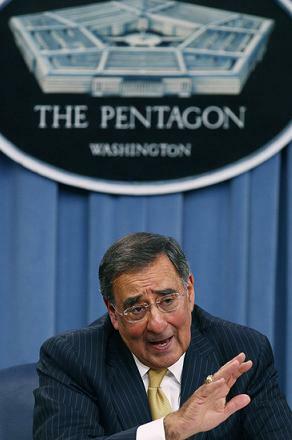 Could it be that the WhiteHouse can influence Panetta better than they could Petraeusl? Was Panetta nominated as CIA Director in 2009 by O'traitor? Petraeus record is exemplary while Panetta's is more in line with what the commies are trying to do. So now they have an insider, able, and most likely to be directed, to dismantle the greatest military machine in history. Now we have a Supercommittee and the rules laid down are if they don't act and deliver 1.2 Trillion in cuts, DoD is gutted for over 500 Billion. Who better than the new puppet to decide what get's cut. Anytime they are willing to show their hand, watch the other hand. Ok. maybe I'm making a leap here, but others say Pinetta is no friend of DOD or America. They be Cliff Kincaid and Trevor Louden, writers and researchers on national security issues. We MUST cut spending across the board. Period. 1.2 trillion over 10 years? This is not serious. Anyone who thinks that any of the proposed "spending cuts" will help our situation needs to do some research, look at the numbers, and understand what is really going on. I don't really have time to explain it, but suffice to say that we are staring into an economic abyss and nobody in Washington is taking it seriously.